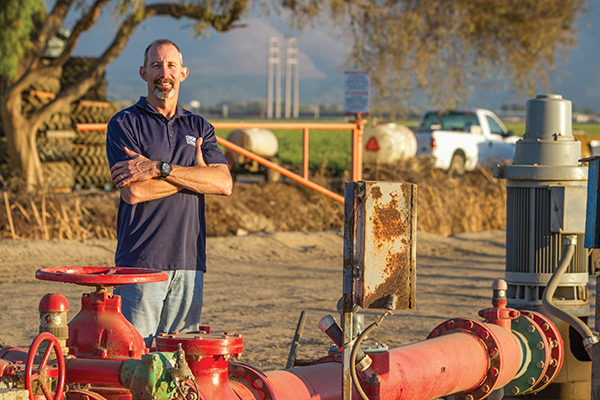 Pumping wells like this one in Oxnard are huge drinking straws plunged straight down into the Earth, says Jim Evensen Jr. ’86. It’s still easier to draw water from aquifers than to put it back. News photos of dry, cracked riverbeds and parched fields stretching off into the horizon serve well to depict the distressing impact of California’s worst drought in memory. But the picture would be more accurate if cameras had X-ray vision. Their lenses pointed down toward the center of the Earth, they would capture images of a sprawling underground network of natural reservoirs, manmade aquifers and everything in between. Some of these deep-down resources are drying up as thirsty California communities grow increasingly dependent on groundwater. 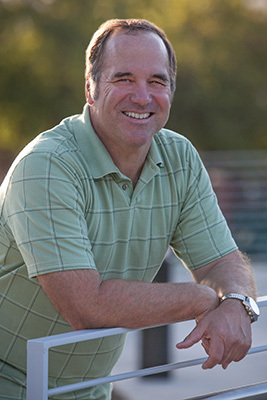 “We have probably 10 times as much groundwater storage capacity below ground as we do surface water storage capacity in California,” says Jim Evensen Jr. ’86, a hydrogeologist and co-founder of The Source Group Inc., an environmental consulting firm headquartered in Thousand Oaks. That massive underground storage capacity notwithstanding, Evensen adds, nobody knows for sure how much water is down there, since the state has had no systematic monitoring in place. What’s for certain is that increasingly aggressive pumping from wells is taking its toll. Aquifers, which are estimated to supply 30 to 40 percent of the state’s water in years with average rainfall, are supplying closer to 60 percent during the drought. With rivers and surface reservoirs visibly at record lows, Gov. Jerry Brown last January declared a drought state of emergency and called for an immediate 20 percent decrease in water use. In September, he signed a package of three bills that lays the groundwork for statewide regulation of pumping from underground aquifers. The new laws promise to be tough on farmers and municipalities alike, with fines and other penalties for violators. The drought remained in political focus as this magazine went to press and Californians voted on $7.5 million of bond funding for water-related projects. Edgar Terry ’81, MBA ’83, a fourth-generation farmer in Ventura County, feels the impact of the drought every day as president of Terry Farms Inc., keeping watch over 1,800 acres of strawberries, bell peppers, celery, lettuce and cilantro. “The drought situation in California is very real, and scary,” says Terry, who has had to use more pumped-in groundwater from local wells. “The peppers are beautiful, doing just fine,” he says, but the strawberries are suffering: Salt levels build up in the dry soil and the plants can’t produce their usual abundance of plump berries. But the county’s farmers face a new challenge: In response to the depleting aquifers, the water management agency recently changed the methodology for calculating how much water any particular crop requires. Allotments are very tight, Terry says, and growers who pump more than their allotted water will have to pay fines. Scott Rigg, M.P.A. ’99, closely watches water supplies in the City of Vernon, where he is superintendent of the Department of Public Works and Water. Near downtown Los Angeles, Vernon is home to 1,800 businesses and very, very few residents. The almost 100 percent industrial zone includes everything from meat packing companies to apparel factories to manufacturers of hospital medical supplies. Keeping all that commerce flowing requires plentiful water – 2.8 billion gallons annually distributed via a complex network that includes eight wells, six ground-level reservoirs, one belowground reservoir and an elevated tank. Water is pumped into the system from other sources. “We basically rely on the water we pump out of the ground – 90 percent of our supply is from groundwater,” Rigg says. “We have what we call ‘adjudicated rights’ to pump out of the central water basin” operated by the Central Basin Municipal Water District, which also feeds 25 other nearby communities. The city also has a direct connection to the Metropolitan Water District, which provides a supplemental source and emergency supply of water. That water doesn’t come free. For every acre foot, about 326,000 gallons, Vernon pays $268 to the Water Replenishment District of Southern California, which supplies 43 cities from local sources as well as the Colorado River basin. “We have procedures in place to use minimal water, and our business owners operate their facilities very efficiently,” Rigg says. Still, Rigg recently led efforts to cut usage in accordance with the governor’s drought state of emergency, which required municipalities to put tougher water conservation rules into place and back up their progress by providing data on monthly water use. In August, Vernon announced rules such as 15-minute, three-times-a-week limits on the irrigation of landscaping and a 72-hour time frame for repairing plumbing leaks, breaks and other malfunctions. The Source Group has also been enlisted to help with the rollout of the state’s water management legislation, by taking inventory of water supplies and studying the hydrogeologic structure and storage capacities of underground basins in places like the agriculture-rich San Joaquin Valley. The state has not been doing well at managing its water basins, says Evensen, noting that a large portion of wells aren’t metered to keep track of how much water is being pumped. Evensen is also pushing for making more strategic use of the state’s massive groundwater storage capacity. Basins that currently have very low water levels or are even completely dry present a potential opportunity to store millions of acre feet of water. While it’s a lot simpler to pull water out of the ground than it is to put it back in, engineering is going on every day to make it easier, he says. While shimmering lakes and reservoirs are beautiful to the eye, Evensen says, there’s another kind of beauty to storing water underground. Rainy days would be greatly appreciated by people like Rigg and the City of Vernon. “We’re in pretty good shape right now,” he says, what with the city’s stricter conservation measures helping to keep problems in check. But if the drought persists? In Ventura County, Terry and his fellow growers are praying that it will rain this winter and making plans for what they’ll do if it doesn’t. “If we have a good year, which would be greatly loved, we could get some water underground back into the aquifers,” he says. But to completely replenish the aquifers would require five straight years of average rainfall – 15 inches every year. “That’s not unheard of,” he says. Meanwhile, he’s puzzling over which crops would be best given tight water allotments and whether he’ll take the momentous step next year of leaving some of his land fallow. Judy Lin is a staff writer for the UCLA Newsroom and has been a writer for the Chicago Reader and an editor for Prevention Health Books.